For his dominating effort in the win over the Oakland Raiders last weekend, Philip Rivers was named AFC Offensive Player of the Week on Wednesday. This is the second time the Bolts’ starting quarterback won this award this season. The won the honor after the Thanksgiving win over the Dallas Cowboys. Rivers and Tom Brady of the New England Patriots are the only players to win the award multiple times this season. “In a lot of ways I had a good year,” Rivers said. Rivers has been healthy all year and played some of the best football of his career this season. 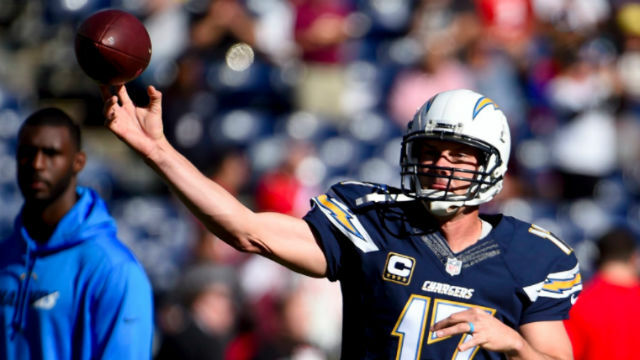 In Sunday’s game against the Raiders, Rivers was 28-for-37 for 387 yards and three touchdowns. His efforts against the Raiders helped the Chargers finished the season No. 1 in passing offense with an average of 276.9 yards per game. Rivers also tied Fran Tarkenton’s record for sixth all-time passing touchdowns with 342 yards and also become the ninth player in NFL’s history to pass for 5,000 passing yards.